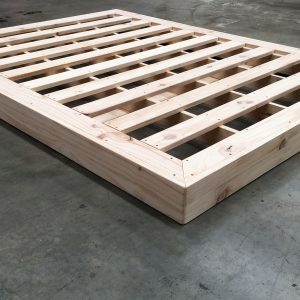 Perth’s pallet specialists, PALLETWEST, specialise in both the manufacture and supply of new and second hand timber and plastic pallets, and as an Australian owned business, we take great pride in delivering products and services that exceed our customers’ high expectations. Along with a broad range of high-quality pallets, PALLETWEST now also manufactures and supplies an outstanding range of high-quality pallet furniture in Perth for both the commercial and residential markets. We do more than simply create attractive, durable and long-lasting pallet furniture for commercial and residential customers, at PALLETWEST we offer a complete design and supply service for all your pallet furniture needs. We’re able to supply customers right across Australia with attractive custom manufactured pallet furniture with a contemporary feel in a broad range of designs, sizes and styles to suit all tastes and applications, both indoors and out. 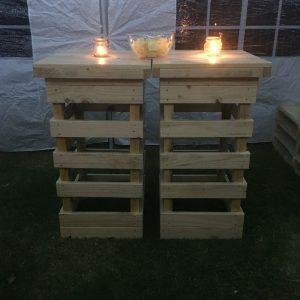 So, whether you operate an interior design business, an events and hire firm, or you’d like to improve your indoor/outdoor spaces at home with the addition of high-quality pallet furniture that’s attractive, yet extremely durable and reliably sturdy, PALLETWEST can make and supply you with the pallet furniture you’re looking for. 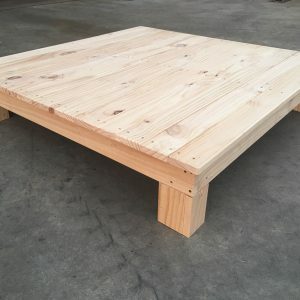 Most of the pallet furniture that we design and manufacture here in Perth is available in three standard sizes, which most customers find to be an adequate selection for all their indoor and outdoor furniture needs. 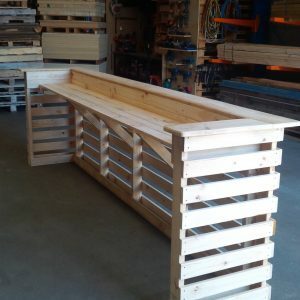 However, as we design, manufacture and supply all our pallet furniture ourselves at our Bibra Lake facilities, should you require bar tables, planter boxes, workbenches, beds, outdoor sitting furniture, tables or chairs of a different size, that won’t be a problem at all. 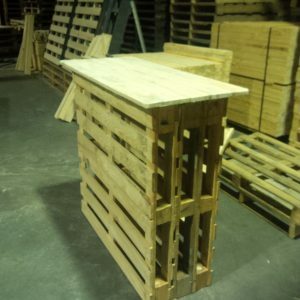 We’re able to custom design pallet furniture to meet your specific needs, so don’t hesitate to give the pallet experts at PALLETWEST a call to discuss your custom furniture requirements. 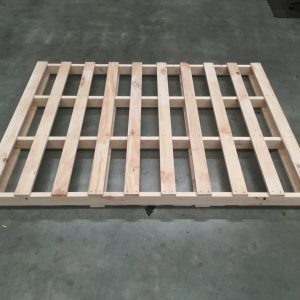 A misconception about pallet furniture that many people seem to have is that since pallet furniture is made from pallets, that it must be cheap and of a poor quality. That isn’t the case at all. 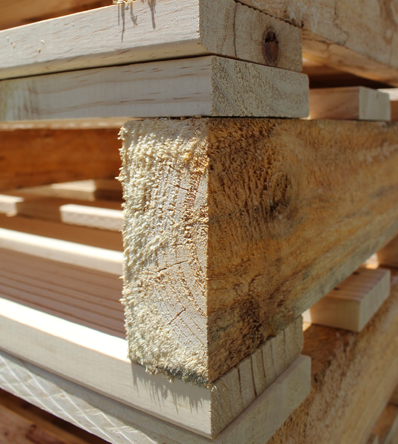 All of our pallet furniture products are manufactured with the highest quality materials and finished to a particularly high standard of workmanship. 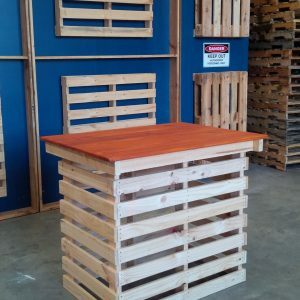 At PALLETWEST, we always strive to produce pallet furniture for both interior and exterior applications that are durable and long-lasting, sturdy and secure, and add to the complete look of your design concepts at home or at your place of work. 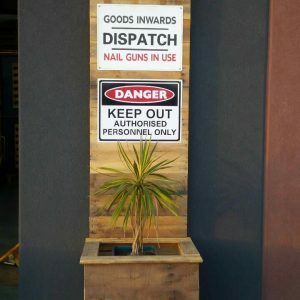 To learn more about the premium quality pallet furniture we design and manufacture in Perth, or enquire about delivery options or having custom pallet furniture created, please contact one of our friendly staff to discuss your pallet furniture requirements.